The Isle of Bute, off the Scottish coast, is a place to breathe. It is as far from the horrors of Hillsborough as Tony Edwards could find. Twenty years ago Tony was a South Yorkshire ambulance driver who answered a 999 call and found himself facing hell. Tony arrived at the Hillsborough ground only to be told by the police that he could not go onto the pitch "because they're still fighting". No fans were fighting, as was plain to Tony from the start. He drove on in defiance. 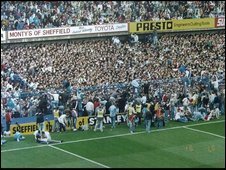 What had happened was that, under the leadership of an officer who had never before organised a big football match, the police had failed catastrophically in crowd control. Fans were shepherded onto already overcrowded terracing with no hope of an exit. As a result, 96 died. Hundreds more were injured. 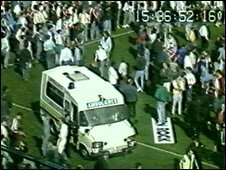 When you look at video footage of the disaster, which was screened live on the BBC's Grandstand programme, you see Tony Edwards's ambulance, alone, making its way to the touchline at Leppings Lane, the Liverpool end. "That's when I noticed the first body on some billboards. And I thought 'Is he dead?'" Even today, twenty years on, he seems momentarily incredulous. He recalls fans tended to the dead and injured while many police officers were standing, looking on, "frozen" - the description attached by Lord Justice Taylor to Chief Superintendent David Duckenfield, who was supposedly in charge. Even now, and the clock on the tape shows the time was 3.36pm, the police had failed to understand what had happened and was still happening before their eyes. At the inquest into the deaths, the coroner ruled that all had sustained their fatal injuries by 3.15pm. That was the advice from the pathologists he had consulted. But many of the bereaved families and survivors of Hillsborough believe their loved ones were still alive after 3.15pm and perhaps, given proper medical assistance, could have been saved. This view has subsequently been supported by some of the country's most eminent pathologists. But the coroner's 3.15pm cut-off means there has been no accountability and no meaningful inquiry into the emergency response. The families feel it has proved a convenient get-out for those who should have had a duty of care at the football match. "Even if only one person could have been saved lessons must be learned from Hillsborough of how to go about these rescue operations. People were feeling for a pulse, finding none and throwing a coat over their heads." 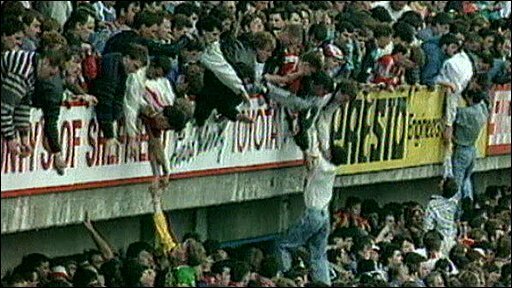 Tony Edwards recalls the chaos with which he was confronted on the pitch as supporters, denied stretchers or the most basic first aid equipment, carried the dead and dying on advertising hoardings to the Hillsborough gymnasium, which later served as a mortuary. "They placed the bodies on their backs (rather than face down, the correct recovery position). In their panic, they were doing it the wrong way and nobody knew. "I think, had we got crews onto the pitch, had we organised ourselves in the way you organise a major incident, then today the story might have been very different." Tony Edwards and those bereaved or scarred by Hillsborough have spent twenty years pressing for justice, for some sort of explanation as to who exactly was responsible for so much going wrong at an FA Cup semi-final and why no individual has ever been held accountable. 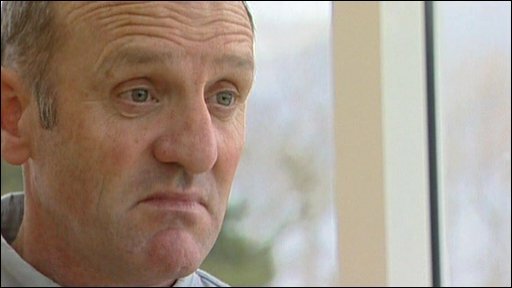 Chief Superintendent Duckenfield for example, who initially lied by suggesting drunken fans had created the crush, escaped disciplinary measures by resigning on a full pension. After two decades there is little faith left in a legal system the families and survivors of Hillsborough believe has consistently blocked their path to the truth. Tony Edwards holds the common view. "It's always been covered up."